We’ve all heard the predictions that artificial intelligence, and by extension robotics, is gunning for our jobs. Indeed, as technology marches relentlessly forward, it feels like many of today’s positions could soon be displaced. But just as with past technological inflection points — whether the steam engine, the telegraph, the computer or even industrial robots — technology will always give as much as it takes, as it always has. That matters little to people who have lost their jobs though. You could argue that the current political climate is due, at least in part, to economic changes driven by technology being created in Silicon Valley. Yet for all of the rhetoric, there are millions of jobs going unfilled in the US today simply because people lack the requisite skills. Instead of a net job loss, that could mean the nature of work is simply changing. While some of the past jobs won’t be coming back because of economic shifts, market dynamics and, yes, technology; the next generation of employment will likely require much higher-level skills, and we are going to need retraining continually over our entire working lives. Perhaps technology, which is at least partly responsible for the problem, could help us out of this quagmire. And, in fact, we may actually be on the edge of finding an answer in the form of augmented and mixed reality. While no single piece of technology is likely to be a panacea, AR could be part of an overall solution to help prepare and train workers for the next generation of jobs. And that’s a start. Imagine putting on a pair of glasses that can understand where you are in time and space and being shown a diagram, a set of instructions or even a 3D hologram that overlays the office or shop floor in front of you, and then steps you through a process you’ve never done before. AR could do that. While virtual reality completely immerses you in a virtual world, augmented reality, as the name implies, acts as a layer on top of the world in front of you. You are still in the room, and you can still see your desk or your living room or the factory, but there is additional information being projected onto the scene you are seeing. Pokemon Go was the first real consumer-driven example of AR and it was a great proof of concept, which helped popularize the idea for a mass market. And just as Pokemon Go simply used a smartphone or tablet as the AR interface, not a pair of special glasses hardware, much of the early use of AR in business involves simply holding up a tablet or smartphone to project the information over the world. As we move forward though and the tech evolves, wearable hardware will enable employees to work hands-free and that has the potential to be much more powerful. In a recent report, Tractica, a research firm focused on robotics, AI and wearables (among other topics), sees augmented and mixed reality headsets having great utility in an enterprise or industrial setting. “AR headsets provide an ideal UI for hands-free operation, with the device at eye level, presenting information when needed. AR headsets can also bring powerful first-person views, which are valuable hands-free resources for field force automation, training, or maintenance jobs,” the Tractica report stated. Among the vendors in this space looking at business use cases, perhaps the best known is Microsoft Hololens, and while Microsoft has a big headstart in terms of hype and reach, the market is still developing with smaller companies like Meta, Osterhout Design Group (ODG) and Daqri, among others also trying to make a play. It’s worth noting that Facebook announced an augmented reality tool to create customized image filters at F8 in April, while a third-party developer, Amber Garage, announced HoloKit earlier this month to build mixed reality content for Google Cardboard and Apple released an AR content creation platform at the recent WWDC event. Samsung is also working on MR tools and you can bet that Amazon could enter the fray at some point too. While these tools appear to be aimed mostly at consumers, it’s not unlikely they could be used for business too. 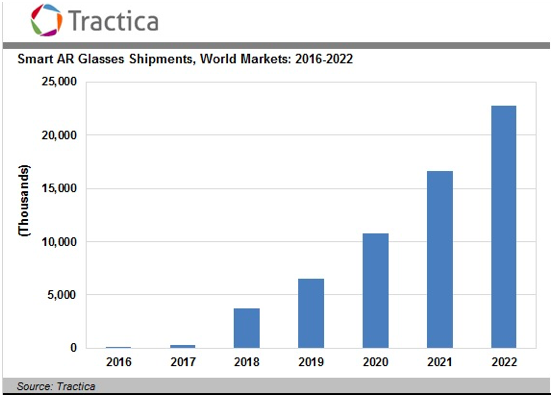 While Tractica remains cautious, especially given that the market is still in the earliest stages and is being defined as we speak, it is still predicting some pretty substantial growth over the next several years. Keep in mind that some of that growth will be driven by consumers as well as business, and it doesn’t break out the different market segments. Exactly how much AI and robotics will displace jobs is subject to debate, but it will have some impact, that much is clear. The question is how do we minimize the effect and use AR/MR to provide workers with new skills. Brian Ballard, CEO at Upskill (formerly known as APX Labs), a firm that wants to be the operating system for virtual and augmented reality, says we are at a point where we are seeing a convergence of humans and machines and we don’t really have a good form factor to engage in that. As he sees it, when you train people in a classroom, you end up with some displacement, as you take the worker out of the context of their work. “At a base level people need more skills to do their jobs,” he says. “What we see in real life is that there is a way to get better information right way and it’s always available to see,” he added. That better way involves using AR glasses to place the information in context right in front of the employee. Brian Mullins, CEO at Daqri, makers of mixed reality headsets, sees these devices as a way to bridge the skills gap and train workers for new jobs. “Augmented reality is a modern technology that is human focused, and when done right, focused on knowledge transfer. You can show a worker how to do something that they didn’t know, and give them actionable information to make the right decisions,” he explained. And that could make for a very powerful training tool. While AR is still in the early stages of development and most training solutions remain in the experimental stage, what we have seen so far shows great promise to speed up the learning process. It’s going to be up to the vendors, content producers and users to take us the rest of the way. For instance, GE is working on technology with Hololens to teach people without a medical background to use an ultrasound machine and identify the correct organ. It’s still very much in the experimental stage, but it is a clear example of using mixed reality to teach people a given skill and give them immediate feedback to help them learn to use it effectively over time. Further, research conducted by Boeing, a company that has been working with AR to increasing efficiency on certain jobs like creating wired hubs for airplanes, has shown that workers who use AR for training purposes are more productive, more accurate and they are more satisfied with the experience. That’s right, they enjoyed learning this way, as opposed to be lectured at in a classroom, and trying to recall what they learned when they are back on the job. The study, conducted in conjunction with Iowa State University, looked at building a wing-like assembly. Participants were mostly from the campus community and some were given instructions on a desktop computer in the corner of the room with a pdf drawing, some on a tablet with an adjustable arm, but also with a static pdf, and finally some used an AR system with 3D immersive instructions with animations. 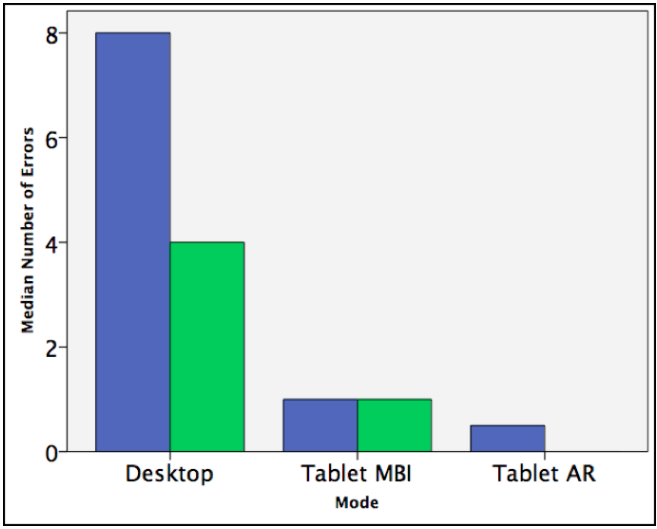 What they found is that the error rate was dramatically higher on the desktop, better on the tablet and lowest using VR. Daqri took that Boeing experiment one step further, conducting more of a real-world proof of concept with Siemens and generated similarly positive results using AR to train workers to service wind and gas turbines. Without using Daqri’s AR helmet it normally took a novice employee (someone just learning the task) 480 minutes to complete their first assembly. Using AR cut that down to 45-52 minutes, a dramatic decrease by any measure. In another related real-world example, Walmart announced plans to use virtual reality to help train workers using content from STRIVR Labs. While this is using VR and 360 degree video to train Walmart employees on management and customer service using Oculus Rift headsets, this could evolve into more of a mixed reality approach over time. Of course, it’s one thing to do conduct an AR experiment, it’s another entirely to move into an enterprise setting with repeatable processes, connected to proper back-end systems like inventory, ERP and other complex legacy systems in place in just about every large company. In fact, Daqri and Dell announced a partnership last month where Dell will help sell AR in the enterprise using Daqri headsets, according to Neil Hand, VP Product Strategy & Innovation at Dell. He says, a big part of getting together with Daqri was to begin looking at areas that could take advantage of this kind of tech. “Being able to do it in a scalable easy way is a large part of why we have created a unique program. We’ve done it before in other technology areas. How do you take a new technology and get it into the hands of more customers,” he explained. It includes working with Daqri on the AR parts, while Dell acts as a consultant of sorts that helps connect to backend systems. Of course, if they can sell some Dell hardware along the way such as using the Daqri headset in conjunction with Dell workstations, all the better. While the companies are hoping it takes off, Daqri has already identified a workflow for implementing AR that involves working in real environments, designing solutions around the user and his or her needs, developing the right UX for the job, measuring the results and expanding into other areas. Of course even with all of that, for now, AR is still a nascent technology, but in the coming years if the markets begin to develop as predicted, it could have a role inside of enterprises helping train workers to stay relevant in a shifting economy and preparing the next generation of employees for whatever comes next.